I strongly believe that crappie fishing minnows are the best live baits that you can use to catch crappie. They absolutely love them! This is why whenever I go crappie fishing minnows are always included in my bait selection. It is very important to know the best and most effective ways to use minnows if you want to get your best catch every time you go out fishing. This article will help you learn everything you need to know about minnows and how to use them in crappie fishing. I live in North Texas, where I have encountered two types of minnows. The first is the common shiner, popularly known as the shiners. These are the most common type of baitfish. They are slim and extremely lively, varying in size from less than 1 inch to more than 3 inches. You can find them in a bright silver or sometimes with a nice golden hue. The second type is the rosy red minnow. This one is a different variety from the shiner and is alled a fathead. Around here they are popularly known as pink minnows. Pink minnows can be found in some bait shops and pet stores. They can either be pink or a rosy red color. Personally, I have not had more success catching crappie with these guys than with normal shiners, so I stick to the normal ones. However, I know quite a few people who swear by pink minnows. Minnows reproduce in the spring, feeding on algae, aquatic plants and really small insects. They in turn feed lots of larger fish, turtles and birds. They have a short lifespan, with some dying naturally in captivity at about two or three years of age. Minnows are very hardy little fish. They are able to withstand drastic changes in temperature, rough handling and low oxygen levels. There are about 18 known types of true minnows around the world. However, I have only had the pleasure of fishing with these two types. From my experience, I have found that sticking to minnows of 1- or 2-inches max will yield the best results when it comes to crappie fishing. Minnows are relatively inexpensive. In bait shops around where I fish, they go for around $3 per dozen. Alternatively, you can also choose to catch them yourself. If you are up for this challenge, you can set up a minnow trap or use a cast net at the same lake you are fishing in. To use a trap, all you have to do is place some dog food or cat food or even plain old bread in it, then tie it somewhere secure like a tree or a dock post. If you leave it overnight, you will find that a few minnows will have been trapped in it by the next day. Just make sure to check with your local authorities if there are any special permits that you may need before you go minnow trapping. If you are a total newbie to this crappie fishing thing, or if you are planning to fish in winter or extremely cold weather, I suggest you buy at least 3 dozen minnows. Why so many, you ask? Well, if you are new, you will probably end up killing a good number of them by hooking them wrong. If it is extremely cold, the minnows will die quicker in the water. The crappie will not strike dead bait, so you will need to keep replacing the dead ones with lively, fresh ones. As I mentioned earlier, crappie do not usually strike dead bait. You need your minnows to stay alive and lively. When you buy them, leave them in the water they came in. When you are adding water, do it a little at a time and make sure that the water you are adding is of a similar temperature to the water they had gotten used to. Do not shock them with drastic temperature changes. For every dozen minnows that you buy, you will need about a gallon of water. Getting a 2 to 5 gallon container should comfortably serve all your needs especially whenever you intend to spend the whole day fishing. If you can, use lake or river water at all times with minnows. If this is not an option, the next best thing is bottled water. Tap water is usually chlorinated, so if you absolutely must use it, make sure you let it sit out for at least 8 hours or overnight for the chlorine to evaporate. Otherwise, your minnows will be dead before you get to your fishing grounds. During temperature extremes, use an insulated bucket with a bubble machine. The bubble machine, also known as an aerator, is important because it injects fresh oxygen into the bucket, keeping them alive. The bucket needs to be insulated to help stop the minnows from freezing to death in cold weather or getting heated up to death when it’s hot. In ok weather conditions, when it isn’t too hot or too cold out, you can bring a regular weighted bucket and toss it in the lake with them inside to keep them alive. Again, this only works when the weather is “good”. If the water is too cold or too hot, you will end up killing all your bait. So, when in doubt, use an insulated bucket with a bubble machine. Check out this article I wrote if you want to learn more about crappie fishing equipment! Your live bait needs to be as lively as possible. This means that before you hook them, you need to make sure that you are using the right type of hook, and also make sure that you know how to place them on the hook. Do not use a large hook for a small minnow, because this is the fastest way to kill it. So what type of hook should you look for exactly? Well, you want a thin wire hook with a long shank. The thin hook is good for minnows while also being harder for crappie to see. They will also easily bend and free up, for example if you get snagged. The long shank comes in handy when it comes to getting the hook out of the crappie’s mouth after it has been swallowed. I have found that Aberdeen hooks fit this description perfectly. Aberdeen hooks are the best for live minnow hooking. They are light wired and designed perfectly to keep minnows alive. They are also long shanked which makes them easy to pull out of the crappie’s mouth. I always hook them through the nostril. This is just a personal preference. As long as you find a style that works for you-you’ll be fine. Float rigs are the most common rigs when using minnows. Attach the hook at the bottom and a split shot about 12 to 18 inches above the hook. Start shallow and work your way deep, because crappie feed upwards. You can also use a bobber if you want. Float rigs work really well because they allow you to more easily control the depth you want while also allowing you notice when you get a bite. Draglining is where you attach a small sinker at the bottom. Use a 3-way swivel 18 inches or so above it with a 6 – 10-inch leader with an Aberdeen hook at the end. This rig works best when fishing for very deep crappie. When you slowly drag the sinker along the bottom, the vibrations attract the crappie nearby and you will soon get your first catch. Minnows are an essential tool for crappie fishing. You absolutely cannot ignore using them if you want to get the most out of your crappie fishing experience. There are many types of minnows. Whatever type you choose to use, make sure they are 1 to 2 inches max. 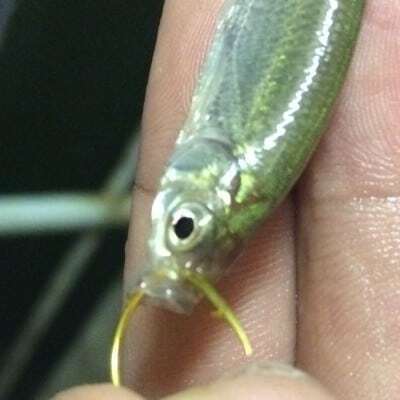 This is the size that works best for catching crappie. Bring at least 3 dozen minnows if you are new at this crappie fishing thing or if you are going to be fishing in extreme heat or cold. If you have been crappie fishing for a while, just bring the number that you feel will get you the best catch. A good rule of thumb is 2 dozen for a day of fishing. Crappie do not strike dead bait. Keep your minnow alive by using an insulated bucket with an aerator. 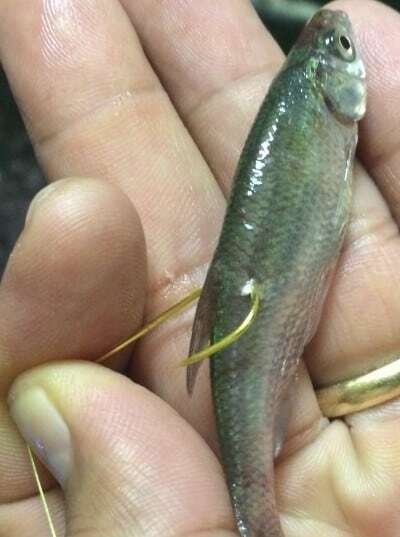 You can hook the minnows through the nostrils, below and behind the dorsal fin, or at the tail. Remember to always check your area’s regulations, because some local authorities do not allow the use of live bait. With these few tips up your sleeve, you will definitely be more effective whenever you go out crappie fishing. Hopefully, you might even surprise yourself with your next catch. Please let me know if you have any questions by leaving them below! Hi Sam! Glad to hear you are considering fishing on your next visit! I agree that crappie fishing is an excellent way to relax and to take in the new environment. I hope you enjoy your visit! Hi there Mike, this post is very useful! I like the fact that you can go bare bones and catch the bait you use yourself, this is truly hunting how it was supposed to be! Thanks again for the post. Thanks Joe! Catching minnows in a trap is actually easy to do and a whole lot of fun. When my little ones used to go out fishing with me (they are too old and too cool now :)), they use to havea blast catching them. All you need is a trap and some bread. You can make your own trap but cutting the top of a 2 liter soda bottle and invert it into the body, creating a funnel of sorts. Tape the contraption together, add bread, drill some holes in the body of the bottle and you are in business! Hi Marianne! I absolutely love crappie fishing and do it a LOT 🙂 It is my favorite thing to do so yes, I have a lot of experience. Having said that , there are a ton of “old-school” anglers that know a whole lot more than me. I learn from them every time I go out there. Minnows are absolutely the favorite bait of crappie. I am convinced of this because I have tried a lot of other live baits. None work as good!